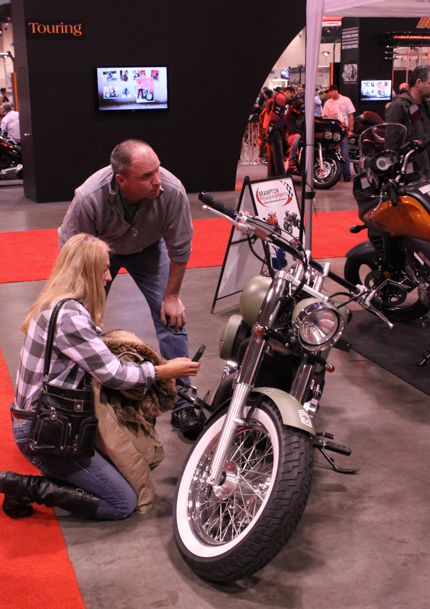 Which motorcycle show have you attended (or hoping to attend) this season, and what has been a highlight? If you’re still headed there this season, what are you looking forward to? We posed the question during a recent chat I facilitated on Motorcycle Mojo Magazine’s FaceBook page.) These riders share theirs. Add yours in the comments below. Mark K. I was able to scoot down to Seattle to attend their show in December. I was really looking forward to the Vancouver motorcycle show but I had to work. Loving the look of the new BMW R1200 GS! Monet B. I’ve never been to a bike show, but I’m looking forward to checking out the Easyriders Bike Show when it’s here in Nashville. Brian L. Was at Vancouver. Don S. Highlight: The Victory Cross Country that I love !!!! Mark K. I always look forward to the Western Canada Horizons Unlimited meet in Nakusp BC in August. Danny B. Will be going to the Moncton show in Feb and looking forward to it and seeing the new Honda lines etc. Roni C. I went to the The Super show in TO… was shopping for a new to me bike…. and I found it! I also found a great case to make a new house of for my dog to ride in! Charlie and I are both going to be happy for a long time to come! Tim D. Yeah, you got that right Liz, unfortunately has a lot to do with our system of motorcycle insurance. John T. I went to the International show, was not that impressed. Fred B. went to the Vancouver show. Got to chat with Glenn Roberts for a few minutes and found nice passenger floorboards for my wife. Arthur A. Heading to the Halifax and Moncton shows over the next few weeks. Just like wandering around and drinking in the atmosphere. Christina M. Supershow at the International Centre in Toronto – highlight was bumping into so many riding buddies, and that this show always is the marker where we know we’ll be riding in another 8 weeks!!! Brenda B. Supershow in Toronto in January. Highlight was seeing what’s new for 2013 and seeing all the CMC denizens. Kevin G. Unfortunately have only been able to hit one show this winter. Looking forward to A.) Riding to the one in March. B.) Remembering to put the fully charged battery into the camera, next time. Peter N. Supershow at the International Centre in Toronto. Nice to see all the bikes and make riding plans for the summer. Christine K. I’m working in the Ontario Tourism booth again at the Spring Show at the International Centre in March. Looking forward to having great conversations about bikes and touring with a wide variety of riders. If anyone’s planning on going, drop by the booth and say hi. Andrew B. My son and I went to the Supershow this month at the International Centre. Since I bought an old Goldwing this past summer, he’s really taken an interest in the whole motorcycle scene. What’s your bike show highlight? At the Toronto show this year, met Liz and bought her book-just finished it, loved it and am now working on my own story!!! It was lovely to meet and chat with you at the show Marilyn! Glad you liked the book – looking forward to reading yours.